without recognition or even pause. No, it's true. the opposite of celebrity happens to be. dancing headlong into the darkening void. Justin Evans lives with his wife and three sons in rural Nevada, where he teaches. 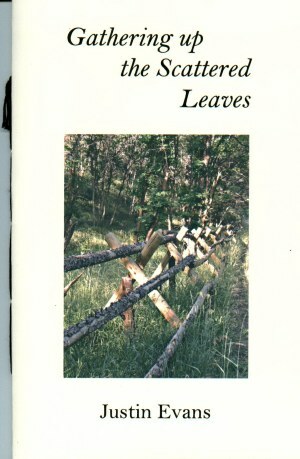 His most recent book, Town for the Trees was also released from FootHills Publishing in 2011. He edits the on-line journal, Hobble Creek Review. is a 32 page hand-sewn chapbook - $10.00. one final descent into the valley of my home. a place to meet and linger in an embrace. another life told as the day passes to night. where we are certain to find a place to stop and sleep. like the old memory of a broken arm. beneath the shirt tails of morning. Justin Evans was raised in Springville, Utah, where most of these poems are set. After graduating from high school, he served in the U.S. Army from 1988-1992 and graduated from Southern Utah University with a degree in History and English Education. In 2004 he completed a Master's Degree in Literacy Studies from University of Nevada, Reno. His previous chapbooks include, Four Way Stop (Main-Traveled Roads, 2005), Gathering up the Scattered Leaves, and Working in the Birdhouse (FootHills, 2006, 2008)For the past twelve years, he has lived with his wife and sons in rural Nevada, where he teaches at the local high school. In addition to writing, he edits the on-line journal, Hobble Creek Review. 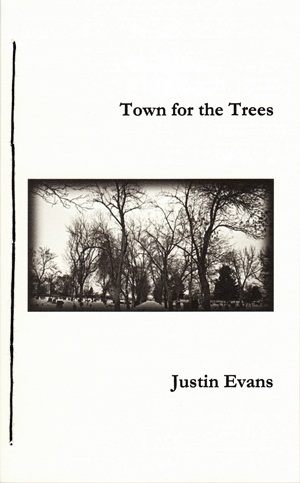 Town for the Trees is a 64 page hand-stitched paper book with spine - $15.00. TO ORDER Town for the Trees ON-LINE To order through mail click here. 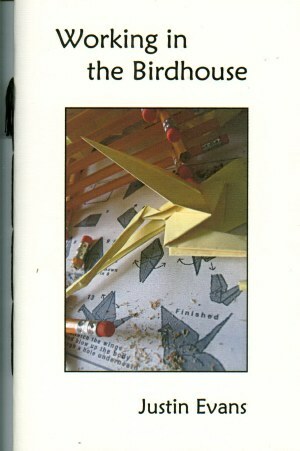 "There is a restless energy behind the poems in Justin Evans' Working in the Birdhouse -- from the unsettled birds that weave and wing their way through the pages to the narrator's treks through the topography of interstates, deserts and even the Garden of Eden. Evans' curiosity about how humans respond and coexist with nature and each other are at the heart of this well-crafted collection." they shroud the remaining daylight. waiting to deliver its message. great multitudes of dark wings. Justin Evans lives in rural Nevada with his wife, Becky, and three sons where he teaches history and creative writing. He is the author of two previous chapbooks: Four Way Stop (Main-Traveled Roads, 2005); and Gathering up the Scattered Leaves (Foothills Publishing, 2006). is a 28 page hand-stitched chapbook. another story told as the day passes to night. where we are certain to find a place to stop and rest. 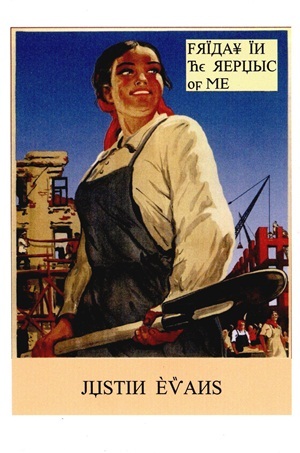 I have long been interested in place being a defining factor in my poetry. Many of the poets who have influenced me, use place as a touchstone for the message of their poetry, and I wanted to do the same. Some have put forth the idea that American poetry is pre-occupied with place, and I certainly see that being true in my case. I wanted to express in this second chapbook, as I did with my first, a sense of longing for the places of my youth. Where I was admittedly darker with my first chapbook, my goal was to be more optimistic and hopeful this time around. Specifically, I wanted to infuse a sense of the ecstatic writings of Rumi with my nostalgia for the places I knew as a young boy. Hopefully, people can gain a sense of how I feel about specific places and my place in them. However, poetry has always been more than expression of artistic ideas; it is a means for me to remain connected with the human spirit as a whole. Poetry is a communion, and as such, allows me to come to the common ground of people with something to share. And even though I am sharing something of me, I believe I am always taking more away from the experience than I could possibly give. Therein lies the magic of poetry, the possibility for me to become more than what is possible otherwise.